← ARSENAL REBUILD FOR 2017/18 : 6 OFF, 3 SUPER SIGNINGS FOR TOP SPOT. Arsene at Ashburton Grove: Where Did Wenger’s Vision Go Wrong? — Or Did It? There’s a big game coming on Sunday between Arsenal and Manchester City, and, of course, it’s a(nother) “must win” for our embattled manager, Arsene Wenger. I’ll be writing a match preview for it soon. In the meantime, before yet another referendum on his tenure as manager, I think it’s time for a bit of perspective on the man and his vision. Like everybody else, I can only share my own. As regular readers know, I’m from California, so I come from a background of watching US sports, which are organized in a (radically) different manner with profit sharing, between clubs and players–and other “level-playing field” elements–well integrated. By comparison, English (and European) club football are like the Wild West. In 2006, when I landed at 17 Highbury Terrace and first fell in love with Arsene and Arsenal, the economy was in a bubble. The pound was nearly 2:1 to our dollar and folks believed things were headed nowhere but up. Watching fans stream from the Highbury-Islington tube station, across the Highbury Fields, and to the always sold out (and packed) new stadium–it really did seem like the advent of something big, modern and full of promise. To my amazement, unlike in my other travels, I couldn’t get in. A few times that autumn, I tried, but the touts (they’re called “scalpers” here in the States) were well-policed and the very few tickets I saw changing hands cost well over 100 US dollars. As such, I learned the game in the nearby pubs with plenty of Gooners who were perhaps also priced out but wanting to be part of the scene. It was a tough early season and there were plenty of grumbles to match the difficult results. 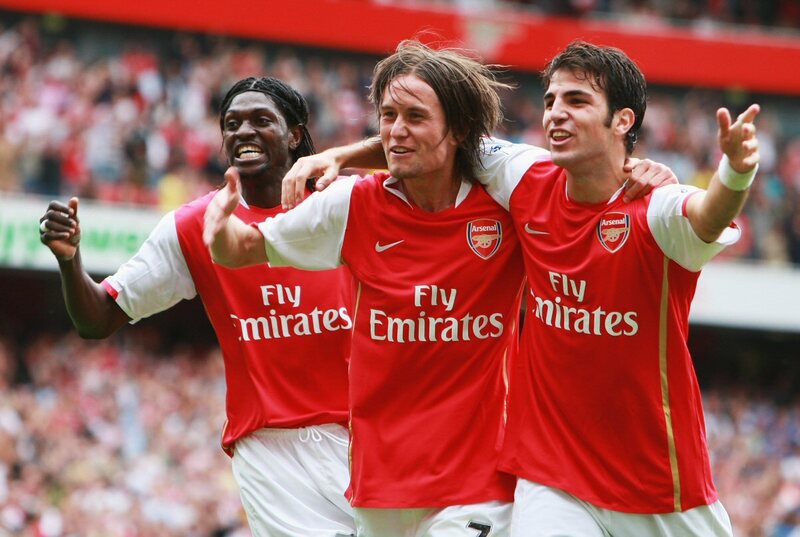 New guys like Tomas Rosicky and Alexander Hleb looked promising but were not considered equal to the departed Patrick Vieira, Robert Pires and Dennis Bergkamp. Thierry Henry and Freddie Ljungberg both carried long term injuries while Robin van Persie had some early season niggles. Cashley Cole had taken the extra 5000 pounds per week to play at Chelsea and we had only nabbed William Gallas in return. The greatest promise resided in 19 year-old Cesc Fabregas and some interesting West African players, the veteran Kolo Toure and the two Emmanuels, Adebayor and Eboue. 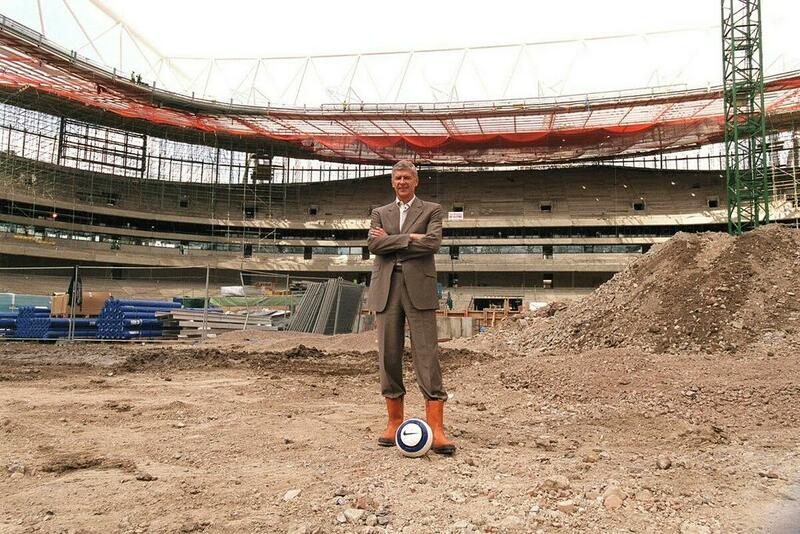 At the center of everything was Wenger. The new stadium and Arsenal’s appearance in the Champions League final that past spring brought a measure of good will–and popularity–to the club, but results weren’t promising. During my stay, there were losses at (pre-Prince Mansour) Man City, West Ham, Bolton and Fulham, not to mention disappointing home draws with Aston Villa, Middlesbrough, Everton and Newcastle. By the end of November, the league title was a two team race between Manchester United and Chelsea. Arsenal would be scrambling, as they did the year before, for a top 4 place and another go at the Champions League. Playing in the season-long CL tournament was the key. Remember, this is when the Vice-Chairman of our Board, David Dein, was president of the “G-14” clubs which hinted that a European Super League might be on the horizon. If such a league were to form, Arsenal would surely be a part of it. In the meantime, a top 4 finish and participation in the tournament was critical. Though the English Premier League had many proud clubs, this was still the era of the “Big Four” (Arsenal, ManU, Chelsea, Liverpool). ManCity hadn’t “happened” yet and Spurs, were, well, Spurs. All of this would soon change. Dein, the man who had brought Wenger to Arsenal back in 1996, would soon be gone, as would many other big shareholders on the board. They sold out to Stan Kroenke, the billionaire husband of one of (founder of WalMart) Sam Walton’s daughters. Kroenke owned several American Sports teams (we call them “franchises”) but was not renowned for making them into champions. On the other hand, unlike the Glasers–the new American owners at Manchester United–he didn’t use his teams to leverage (debt finance) other parts of his financial empire. There was some resistance: then Chairman, Peter Hill-Wood, famously said, “We don’t want his sort,” but, soon enough, Kroenke was the majority share-holder. I was impressed by Wenger’s calm in the midst of this on-pitch and backroom maelstorm; His faith that, with enhanced revenues from the new stadium (and CL participation) plus developing young and highly skilled players–Arsenal could weather it, intrigued me. Of course, all around me, even then, were plenty of Gooners lamenting the premature break-up of the Invincibles, too many new (and often dark-skinned) foreign players, and the fact that the gleaming (but sterile) new stadium wasn’t producing good results–on its perfectly smooth pitch–where it mattered most. My family and I had to return to the States on December 2nd of that year which also happened to be the first North London Derby at the Emirates. Luckily, Arsenal won it in convincing fashion. Later, also in the new stadium, they would beat the eventual league champion, Manchester United, to complete a league double. The first season in the new stadium was a disappointment, but there were signs of promise. The following year, even as Henry departed for Barcelona, the club reinforced with more value-for-money buys (Eduardo, Bacary Sagna) and the team came even closer, leading the league for much of the season until Eduardo’s brutal injury at Birmingham (followed by a run of nil-nil draws) derailed the title chase. That was in the Spring of 2007. The following year Arsenal weren’t as strong in domestic play but made it as far as the semi-finals of the Champions League before being well beaten by ManU who went on to win an all-England final over Chelsea. Another thing happened during that season: the global economic crisis and the collapse of the real estate bubble. Suddenly the value of the Arsenal’s residential project at the old Highbury ground tumbled, costing the club an estimated 100 million pounds. Surely many Arsenal supporters also had to endure set-backs in their personal finances while already exorbitant ticket prices crept up. Meanwhile, the aforementioned Prince Mansour of Abu Dhaby bought ManCity. Like Roman Abramovich at Chelsea, he was a man who commanded a fortune of well over 10 Billion pounds. City cost just over 200 million, a pittance by comparison. It could be argued that Arsenal actually benefitted from the prince’s largess. (“You’re our feeder team,” goes the chant.) Adebayor, (Kolo) Toure, Gael Clichy and Samir Nasri netted Arsenal good money in the coming years. A more painful loss occurred when Bacary Sagna (several seasons later) ran down his contract then signed for City at wages we refused to match. We also lost significant talent to Barcelona; Henry went in the summer of 2007, Hleb in 2008. Fabregas, Alex Song and Thomas Vermaelen were all sold to the Catalan club in the first half of the current decade. As the global economy slowly (very slowly) got back on its feet and–perhaps as a harbinger of future political trends–English football began to look inward, adopting a homegrown player rule in 2010. Wenger, with his eye on the bottom line–much as Kroenke’s were (the majority shareholder hardly watched the football)–responded by buying ever younger players (who could count as “home-grown” in the first team if they’d been at the club long enough) and English ones in particular. 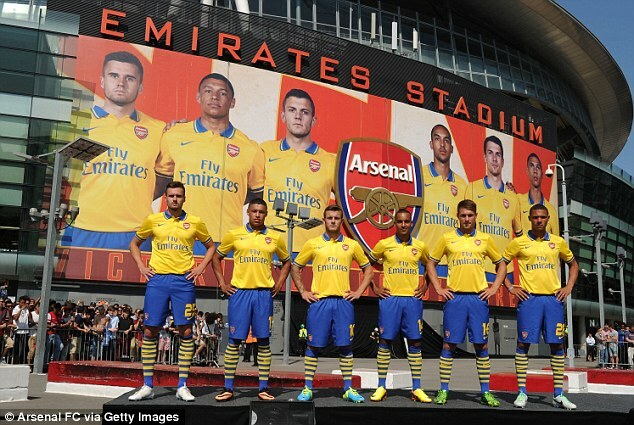 The massive “Britcore” banner on the side of the Emirates came in 2012 and featured Jack Wilshere, Aaron Ramsey, Kieran Gibbs, Theo Walcott, Alex Oxlade-Chamberlain and Carl Jenkinson. Others would follow, including the likes of Callum Chambers, Danny Welbeck and Rob Holding. Some of the youngsters came good, Hector Bellerin, a cast off from La Masia, the Barcelona academy, stands out, while others like Francis Coquelin found roles after loan spells elsewhere. Still others came from well off the radar. Laurent Koscielny was an unknown when he arrived in 2010 but is now regarded as one of the best defenders in England, for example. When needs were extreme Wenger bought veterans and even brought back former Gunners (Henry, Sol Campbell Jens Lehmann) as stop-gaps. Future team captains Per Mertesacker and Mikel Arteta came the summer Nasri and Fabregas left and were instrumental in bringing us up from a real low point, the 8-2 drubbing at Old Trafford and eventually moving us toward another top 4 finish in 2011-12. Another big blow came a year later when Robin van Persie left for Manchester United and helped them win Sir Alex Ferguson’s final title there. Again a pair of older players, Santi Cazorla and Olivier Giroud, were brought in as fillips and again Arsenal were able to retain their CL spot with another top 4 finish. It was all too repetitive for the support and the terrace chant of “Spend some F**king Money” was heard more and more. Finally, in the summer of 2013 Wenger did just that. As Real Madrid plucked Gareth Bale from our neighbors to the north, Wenger took from the taker, spending half as much to acquire Mesut Ozil from the merengues. Still, 50 million Euros was the English record (at the time) for a transfer. Arsenal were back in the game. Except they weren’t. Ozil, a master of filling empty spaces and finding decisive through-balls, was the antithesis of the hard-nosed English player. He did not tackle and he looked to pass before he’d dribble or shoot. It wasn’t long before the Daily Mail’s Neil Ashton famously accused him of “nicking a living.” An early season injury didn’t help, but, when Ozil returned towards the end of the season, the team got up for 4th and claimed their first trophy in nine seasons, Wenger’s fifth FA Cup. The following summer, Wenger brought in another pricey player who looked more the part, the Chilean Alexis Sanchez. Alexis, cast off from Barcelona when they acquired Luis Suarez from Liverpool, seemed a player whose obvious enthusiasm for the game, tireless running and direct, me-first attitude might better suit the English game. Again, however, the league season fell apart and for the 5th time in as many years, Arsenal exited the Champions League in the round of 16. Another top 4 finish and another FA Cup (a record 12th for the club and 6th for Wenger) hardly mollified the crowd. Boring, boring Arsenal–sung originally (and ironically) for 1-nil wins–was now a damning subtext for the club. Ennui is how it’s spelled in Wenger’s first language. Even last season’s 2nd place finish, our best in the Emirates era, was considered unacceptable because we’d failed to take advantage of our rivals’ weaknesses. In the wake of lowly Leicester City’s miracle season and another tame exit from the CL (and an even worse one, at home, to Watford, in the FA Cup) it felt even worse. This season offered promise after some expensive additions over the summer–Granit Xhaka, Shkodran Mustafi and Lucas Perez together cost over 80 millions pounds– but Gooners have seen another title chase fade away alongside another round of 16 exit in the CL, this time by the humiliating score of 10-2 (on aggregate) to Bayern Munich. Now Wenger and his team face a hostile crowd–their own supporters as well as their opponents’–each and every time they kick off. Current results are the worst in the Wenger era and the pressure grows with each match. Meanwhile, Ozil and Alexis won’t sign new contracts as their old ones near their end. Calls for Wenger’s sacking are louder than ever but nobody at the club–except the manager himself–seems to have the power to make that call. A new contract is on the table–or already signed–but a top 4 finish seems hard to imagine given the current toxic atmosphere and the form of the team. 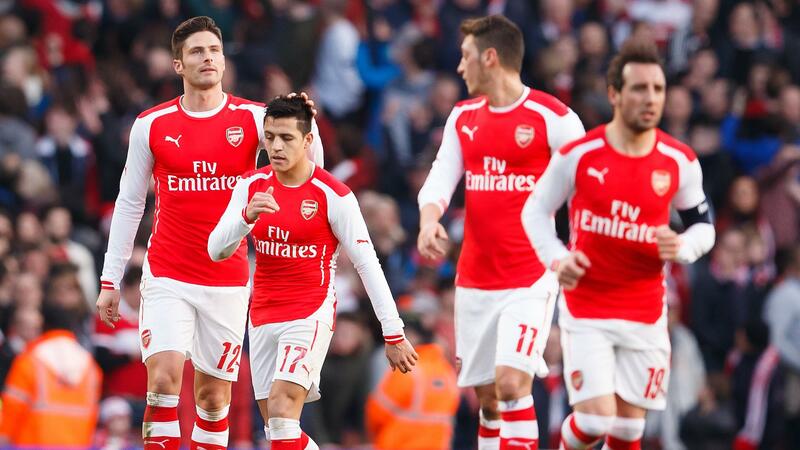 Arsenal have by far the toughest run-in of the top 6 teams and they may face an even tougher challenge in the FA cup. They’ve made the semi-finals and earned a trip to Wembley but face ManCity, currently 3rd in the league. If they pass that test it will be a final vs either Spurs or Chelsea, currently the top 2 in the table. It all seems very, very tragic. Not only the current state of the football–and relations between the club and its fan-base–but the failure of the promise Wenger and Arsenal seemed to represent back in 2006. 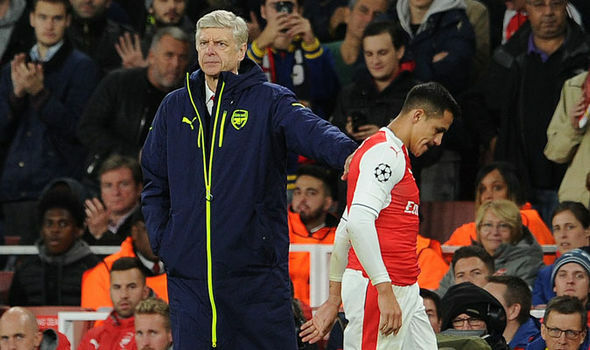 Has Wenger been the maker of his own demise? Was his vision flawed–at least for the post new stadium era–from the start? Does the global economic downturn just as billions of foreign money flowed into the English game play a role? What about just plain bad luck? Has it been injuries, tough draws in the tournaments, bad bounces at critical moments? What about the refs? Are all results fair or could there be an anti-Arsenal (or Anti-Wenger) bias that creeps in, perhaps because of the manager being one of the first from a different country and his insistence on a new footballing culture? What about outright corruption? If Russia and Qatar can buy themselves World Cups, why can’t a Russian Oligarch or the Prince of an Emirate buy a trophy or three? It’s all in the eye of the beholder, most probably. I’m a staunch Wenger supporter (and/or apologist) but I cannot see his tenure at the club ending happily. To me, that doesn’t mean his vision was a bad one. Sometimes things just don’t quite work out–or fate conspires the best laid plans to failure–but that doesn’t mean they weren’t worth pursuing or that the dream was wrong. 17 Responses to Arsene at Ashburton Grove: Where Did Wenger’s Vision Go Wrong? — Or Did It? Arsene Wenger will bring back glory days. I am fully cobfident of that. For me Wengers reign at the club can be split into three eras. 1. Pre Stadium Debt 1996-2004. 3 league titles and 3 FA Cups not too shabby. Financially we were competing with mainly Man Utd and were on an even playing field with most other Premiership clubs. 2. Initial Stadium debt.2005- 2012. 1 FA Cup right at the start as the team fell to pieces. Financially we spent less on players than every other club in the Premier league during this time, Including those that got relegated. We were also now competing in a billionaire funded plaything world. 3. Long term stadium debt.2013-onwards 2 FA Cups. In 2013 we actually received some sponsorship for the first time in 10 years (previously it had been used on the stadium in an up front deal.) 2014 we got extra sponsorship for the shirts( same up front deal as well). so this meant that we had £35 million to spend in 2013 and from then on £75 million plus every summer.. Obviously we are competing in a world where Chelsea and Man City can outbid us due to artificial wealth and Man Utd have a huge marketing income. For me era 1 was a great success. Era 2 would have been brilliant too, if the board and Wenger hadn’t kept feeding us the line about how competitive we were going to be. Era 3 is going a little sideways. The 2 FA cups to start was good but we haven’t kept our spending up since then and the market is getting more expensive. Putting it simply we need to spend more than we have and that involves Kroenke and the Board doing things differently. If it takes Wenger falling on his sword for the masses to realise that Kroenke is the issue. Then so be it. However while Kroenke holds the chequebook I don’t hold out much hope of success in the future. James I agree with everything you said barring one key point. We don’t ‘need’ to spend. And it isn’t because whether or not Stan is willing to spend. Wenger runs Arsenal. I would not even be surprise to know he’s secretly the real owner, lol. Youth is the next step, and the next generation of youth at Arsenal mixed with 1 or 2 key signings. There isn’t a better person on planet earth to manage Woolwich Arsenal FC. James, “Era 2 would have been brilliant too, if the board and Wenger hadn’t kept feeding us the line about how competitive we were going to be. Era 3 is going a little sideways. The 2 FA cups to start was good but we haven’t kept our spending up since then and the market is getting more expensive”. James, but then, would you rather be told there was no hope of being competitive? Fact is at the planning stage of a bigger stadium, with the proposed outlay in new technology, skilled manpower, and the potential to attract big players, there was every reason to be hopeful. What went wrong to scupper all of the projections was the advent of “billionaire owners”, whose interest in football clubs is perhaps as a mere plaything and an ego trip, as against the objective of winning things while being profitable from footballing revenues only. When Roman entered the fray, things got interesting; United got there own billionaire owner, who made, as an overriding pre-requisite for the agreement, the promise to buy the biggest players, sparing no expenses. By the time the Prince of an Emirate got in on the act, the music changed completely. Things have changed now, with deep pocket benefactors being the fad; difference is Arsenal run on the club’s internally generated revenues as against financial doping. There was nothing wrong with the hope of a great future.. In my view, Wenger’s problems today stem from a combination of all of the factors you have listed, in varying measures, with the unregulated introduction of big money owners and a bit of bad luck (to a smaller measure), being the major deal breaker for us. With the way European football was going then, the big teams were known. Then, in the EPL, it was always between United and Arsenal, with Chelsea, Everton and maybe Newcastle/Liverpool/Leeds, rearing their heads on occasion. So, it was impossible to envisage the emergence of Oligarchs and the sheer possibilities of their reach and power, especially as the UEFA and FIFA executives had been quoted promising they will not allow football to be taken over by too much money. You won’t blame Arsenal for assuming their project and ambitions were safe and possible. The more not-so-obvious factors will include the Refereeing decisions (mainly going against us. I don’t believe that “it all evens out” talk) and the timing of injuries (usually to key players). It is no lie that we were looking good for the league title in 07/08 until that horrendous injury to Eduardo. We also looked good until Shawcross snapped Ramsey’s legs in two. These are relevant factors; some will argue about squad depth but let me see how the Chelsea side will look if both Hazard and Costa were to be injured for a season; or if Kante and one of the two were absent for long periods. That is what Arsenal seem to suffer each season. Maybe, it is the training methods, or the kind of players Arsene brought in or even bad tackles, the fact remains that these things happen to us every season. The AST has released a Poll showing majority of the fans polled want the manager gone. Only trouble is with the sample size that poll represents, when stacked against the actual number of Arsenal fans. I have always stood for supporting the team ( with the manager) until the end of the season, or we may find us missing out on top 4 and even Europe, completely. Thanks Seventeenho for a very well written post about our journey over the last ten years. I am not sure there is a better and more loyal fan of Wenger than you, and you described his contributions so well in the historical and economical context of those years. A joy to read and I am proud that you write for BK. You should write a book about Wenger. Congrats on a really well written piece 17ht, A trip down memory lane. Another area where I think Wenger has fallen short, is he has been unable to build a really solid defence, which he had when he first arrived and subsequently developed (I havent forgotten your comment Goonereris). Over the years he has acquired some truly awful players, Squillaci, Sylvester and some fairly average players Senderos etc. mertesacker I thought was a decent buy and Kos was a quality purchase as was Sagan. But then you look at recent purchases, Chambers, Debuchy (although he has been very unlucky). Monreal and Gibbs have been decent defenders, but I doubt they would make it at top level teams. Lastly and this is open to debate. Many Gooners (myself uncluded on occasions) feel that he can be very stubborn on occasions and doesn’t seem to have a plan B . Against West Brom last week, nothing seemed to change, although this of course could be down to the players. I truly hope he turns things around before the end of the season. Even if he is successful in doing this, the team appears to need a major overhaul. A number of contract issues should be resolved quickly and some of the dead wood needs to be sorted out. It is apparent to me that if this is to be done, Wenger needs some support internally. Last but not least please get us a new Vieira. The invincibles defence was Arsene’s, Retsub. Your enjoyment is our enjoyment, Seventeenho. It’s all about perspective and focusing on what really matters and that is what most are incapable of. The American/Kroenke perspective also adds value. For me football in Europe and U.K. is totally fecked by money-dominance and I like the thought of the fairness/equal chances approach to American team sports. It’s gone too far here and it is boring me. Tomorrow is another big game and a fab opportunity to turn the season round. Rather than worrying whether Wenger has a plan B or C or D – frankly he has too many – I am hoping we get back to our plan A and play with believe, passion and discipline. No sweat Retsub 😀And agreed re first defence. Great piece 17tino, I read it a couple of times, it warranted that, we’ve lived much of the times you wrote about and it brought back some warm feelings especially when Arsene was new to England, full of new, fresh ideas and the inside track as far as the French market was concerned. There’s been a lot of changes in those 20 odd years, well documented by your good self. I see no point going over my views, I think I’ve made them ad nauseam. Last season did it for me, all the big clubs in some kind of chaos, Leicester being our only competitors, a perfect storm and he still couldn’t do it. Nothing this season has convinced me that two more years, or more, will see the old Arsene return. Not many managers leave clubs under happy circumstances, I hate to see the lack of respect he’s shown, the media lap it up, opposition fans enjoy the spectacle, that all adds to the angst. Yes the players deserve criticism, but a team is a reflection of its manager. I’m with James when he makes a division of Wenger’s era in three different periods. When it comes to transfers, Dein was the one who actually knew football unlike Gazidis who is totally focused on marketing deals and doesn’t look like a guy who would know the difference between 3-5-2, 4-4-2 and 4-3-3 unless it’s a code for the installment rates. Now, I apologize in advance for the length of this response because it’s getting big now. During this era Wenger made a few brilliant purchases of young players (Ljungberg, Kolo Toure, Anelka). When it comes to the infamous “he-just-inherited-Graham’s-defence”-line, it’s a very questionable one. Yes, he did inherit The Back Five but it was Wenger – not Graham – under whom Arsenal had had the best defensive record ever in the Premier League era (17 goals shipped in 1998-99) until Mourinho’s Chelsea broke it in 2004-05 (15 goals shipped, 29 clean sheets). 2) I think that second era in Wenger’s transfers had started with the arrival of Jose Antonio Reyes in January 2004 and lasted until the summer 2013 – also known as “The Stadium Debt Is A Chain Around The Ankles”-era. It was the first big Wenger’s transfer and the one with a long-term prospect in mind but due to various reasons it didn’t work out well for either side. In the summer we got Robin van Persie, another huge talent that came with a big luggage. With young Frenchman Mathieu Flamini arriving from Marseille and certain Spaniard making a breakthrough in the midfield, it was obvious Wenger was going for younger players with a resale value and different physical qualities to the ones he had been looking after between 1996 and 2003. Departure of Paddy Vieira in 2005 and arrival of Alex Hleb is a good example of the new policy. During that era, Wenger was focused on bringing young talents and signing experienced players only when he felt that plugging the holes is needed. The one big exception was Andrei Arshavin when Wenger had been scared we would miss the Champions League football. That second era could be divided in two different parts. The brighter one was until 2008-09 when most of his top purchases were made (Adebayor, Hleb, Rosicky, Ramsey, Diaby, Sagna) and the darker one was after Dein’s departure when Wenger lost on number of top players because Gazidis has never felt the need to push Wenger forward when he was dithering over a player. Let’s just name two players – Xabi Alonso and Hazard – who would have changed the course of Arsenal history. Wenger went for cheaper options incorrectly deciding to follow his favourite book “The Transfer Manual” from 1998. That’s why we got Gervinho and not Hazard. During the darker period, Arsenal had signed/promoted a few HG-players (Jenkinson, Chamberlain, Wilshere, Gibbs, Szczesny) that have never reached their full potential. In the latter era, however, we did pick a few players in their peak years without coming close to break the transfer record (Arteta, Mertesacker, Podolski, Cazorla, Giroud, Monreal). 3) The third era is the one that started with Özil’s arrival but I’m afraid it will end this summer. That’s the first era in which Arsenal didn’t have to act defensively in the transfer market (as you might have remembered, in 1999 we lost Anelka to Real Madrid and in 2000 Petit and Overmars left Arsenal for Barcelona with Vieira being subjected to Ferguson’s sweet talk in 2001 and closer to the exit door than Alexis Sanchez is these days). We got Özil, Sanchez and Cech in three different transfer windows before making the biggest spending last summer to get Xhaka, Mustafi, Perez and Holding. Yes, we are still light years distant from the spending of Manchester City and Manchester United but we do spend a lot of money without recouping money from selling players. As one Yugoslav poet used to say: “Will the freedom be as beautiful as it was when the slaves sang about it?” We were all singing about the days when Wenger would be able to spend money only to find out a sad truth that, now that he has money to spend, he looks like he has lost the ability to spend it right way. There are trains that we have to catch in order to get on the desired destination. If Arsenal had signed Suarez in 2013… Or Xabi Alonso in 2009… Or Hazard in 2011… Too many wrong calls on big players have been made and the ones Wenger has gambled on have either betrayed him (van Persie, Fabregas) or haven’t reached their full potential or, even worse, have reached their full potential which is not good enough (Wilshere, Walcott, Chamberlain). Right now, Arsenal don’t look like a team with a bright future regardless of Wenger’s future. In fact, if Kroenke remains the majority owner for the next five years, I can see us falling closer to the level of Everton and, who knows, Aston Villa than to any of Manchester clubs, Liverpool, Chelsea and, gulp, Spuds.